Maybe you’d like to have someone else do the cooking more often, but you’re on a budget. What can you do? You could be eating out for way less than you think, and much more often. A recent Zagat survey found the average per-person cost to dine out in the U.S. is $39.40. Ouch! But when my wife and I go to Applebee’s, we eat for free. You can sometimes cut the cost of a lunch or dinner out by more than half using these 25 tips. That means you can eat out twice as often on the same budget. Search the “Amex Offers & Benefits” section on your American Express account page. Our upcoming free meal came from a $10 credit offer for buying something from Newegg.com using Amex Express Checkout. I used each of my three Amex cards to buy a $10 printable gift card for Applebee’s. The $10 credits appeared on my accounts within a few days, refunding 100% of my purchases. Voila — $30 to spend at Applebee’s! Basic statement credits offers are common. A recent one was “Spend $30 at Chili’s and get a $10 statement credit.” Click the offer to load it to your account and use your card when you pay. That’s it. Offers are tailored to individual accounts. For example, one of my cards has 64 offers (three for restaurants) while another only has 25. You can also follow the Amex Special Offer Facebook page for deals sometimes not available on your account page. Many people don’t realize you can buy discounted gift cards for restaurants online. I recently bought a $25 Applebee’s gift card (yes, we eat there occasionally) on Cardpool for $19.75 — a 21% discount. I stick to big sites like Cardpool and Raise. I’ve never had a problem with printed digital cards or physical cards sent by mail. Want to save even more? Buy discounted gift cards through cash-back websites and use a good cash-back credit card to knock a higher percentage more off the cost. Use one of these cashback credit cards when eating out. Getting 1-2% back may not sound like much, but the savings add up when combined with these other strategies. If you have a Chase Freedom card, check their cash back calendar to see when you’ll get 5% back on restaurant meals. Try eating at restaurant bars during happy hour. You’ll save on drinks, and find half-priced appetizers at many places, often only in the bar area. Seating is another advantage. When we’re happy to sit at the bar, we often walk past lines of people waiting for tables in the main dining area. When we became vegetarians, my wife and I avoided meat by ordering side dishes and appetizers. Sometimes it ended up being the best food in the restaurant, and the meal was much cheaper than two entrées. Before slot-machine casinos were outlawed in Florida, many offered players free drinks and meals. We went to one that gave us each a free dinner and $5 for the slots. We ate before we lost any money, so we got a free meal and made money. Free meals are less common now, but many casinos have inexpensive restaurants to attract customers. They also have events with free food, like free slot tournaments you can find online. Most restaurants have their menus on their websites, so you can choose a place with inexpensive dishes you like. We also use their websites to find daily specials before we go out. You can also see menus for restaurants across the country (even some that have no website) at AllMenus.com. Find vegan groups on MeetUp and join one that regularly has pot-luck dinners. For our last vegan potluck dinner, we bought two cans of dolmas from Trader Joe’s and stacked them on a plate with some lettuce-leaf garnish. They were a hit, and we ate ten delicious dishes brought by others. Even if you’re not a vegan you’ll be welcomed as a potential convert. It’s a great way to get out of the house and have a big meal that’s (mostly) cooked by others. Items on lunch menus almost always cost less, even when they’re the same entrées served for dinner. So eat out for lunch to save money. You can eat an early dinner at lunch prices if you go to one of the many restaurants that serve lunch until four in the afternoon. We especially like to eat lunch out as a cheaper way to check out expensive restaurants. We sometimes buy a few things when we go to Whole Foods to eat all the free samples. But we also eat enough samples to fill up for free, justifying the cost of the wine and craft beer they serve (and yes, you can drink as you shop). Ask employees in your local grocery stores if they have special sample days. Wine and beer with dinner can quickly get expensive. Make eating out about food, and save the drinking for when you get home. We order water with lemon (always free). If you are going to have wine when you eat out, why not bring your own? According to Eater.com, many restaurants will let you do this. It’s certainly cheaper than paying full price for a glass off the wine list! Unless you’re going to make a meal out of them as way to save money, skip the appetizers. In our experience, most restaurant meals provide more than enough food, so save the money. If you like a restaurant, and it has a club or mailing list, sign up! You’ll get emails with special offers and maybe a free appetizer once in a while. We receive both regularly from several restaurants. The Financial Industry Regulatory Authority (FIRA) warns “free-meal investment seminars are not solely about education.” They’re meant to sell you something. Still, they are educational at times, and entertaining. We’ve eaten the free meals many times without buying anything. Earl Bronsteen has done even better, writing a book about his attempt to eat 50 free lunches at financial seminars in one year. Dining at an all-you-can eat buffet is a way to get the most food for your money. If like us, after a lunch buffet you’re too full to eat dinner that night, you’ll reduce your food expenses, but maybe not your weight. When we find restaurants that serve large meals (most of them), we order a meal to share. Once in a while a restaurant will charge a couple dollars for the extra plate, but even then it’s a way to reduce a dinner bill substantially. This works especially well at Mexican restaurants, where you are likely to be half-full from the tortilla chips by the time the meal arrives. Often the daily special at a restaurant is much cheaper than the other entrées. But beware, there are two kinds of daily specials. The ones announced that day are often a way for a restaurant to use up old food. The regular specials that rotate by day are a better bet for a fresh meal at a lower price. After using at least 100 restaurant coupons I can tell you: Read the fine print! A buy-one-meal, get-one-half-off coupon gives you a discount of only 25%, and even less if you have to buy two drinks just to get the deal. How do you enjoy the ambience of a high-end restaurant without paying premium prices? Eat a light meal at a cheap restaurant first, and then go to the expensive place with a view for drinks and/or desert. Yes, we do this, too. If your goal is just to have someone else cook, order pizza for delivery. A couple pizzas can feed four people for much less than eating out. Ideally, you’ll also have a coupon. If you really want to get out of the house, take the pizza with you (see the next item). If you want to get out of the house and have someone else cook, order Chinese takeout and head for the park or lakeshore. In our experience takeout boxes hold more than you normally get at the restaurant, so order one meal to split and take it to a nice picnic spot. Plus, you don’t have to tip. This can work with other types of takeout food as well. If you are going out with your children, here’s a list of restaurants where kids eat free. That could cut your cost in half. Check out these places that give you free stuff on your birthday. Free food rules. The most powerful way to cut the cost of eating out is to combine two or more of these strategies. 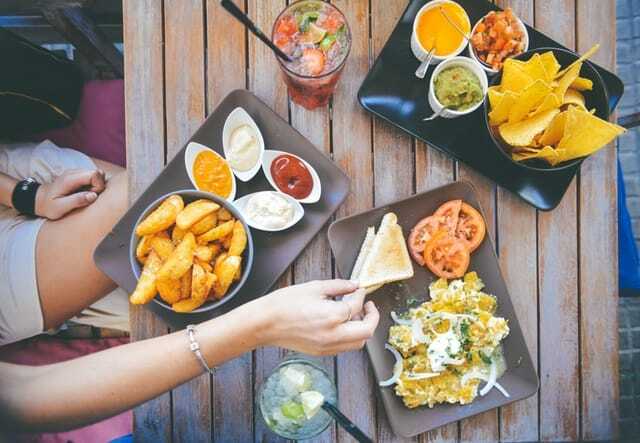 You might eat half-priced appetizers at a restaurant bar during happy hour using a discounted gift card that you bought with a cashback credit card. Then have the second beer or glass of wine at home. Your Turn: How do you eat out for less? Let us know in the comments!